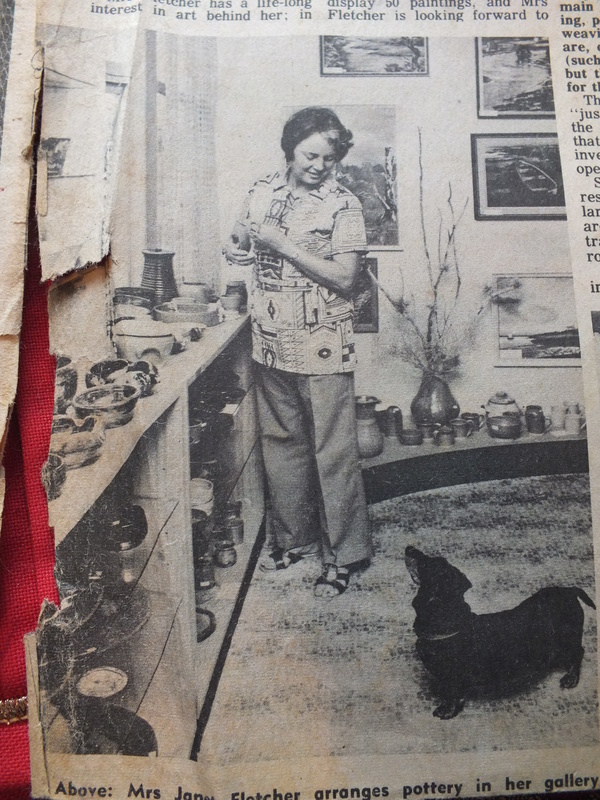 Some time ago I wrote about a visit to one of the Waikato’s early female potters, Phyllis Atkins. 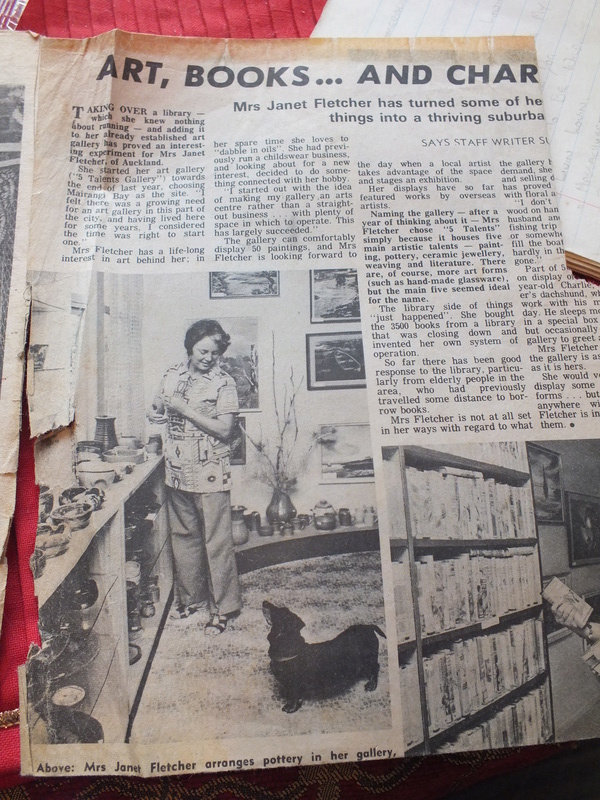 Now, I offer an article about June Clark, the other largely undocumented potter from this region working in the Arts and Crafts tradition (the genesis of ceramic craft in this country) of the early lady potters such as Olive Jones, Briar Gardiner, Mavis Jack and most crucial of all, Elizabeth Lissaman. 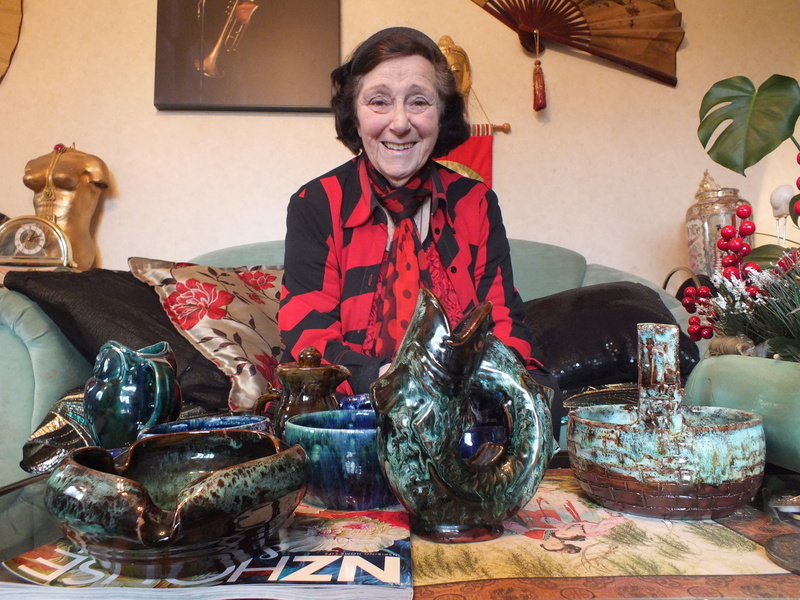 Lissaman is considered the grandmother of New Zealand studio pottery. June Clark’s pottery is found almost as frequently as the work of Olive Jones, Briar Gardiner or Elizabeth Matheson (aka PAKA pottery), suggesting an operation nearly as large and sustained as that of any of these other early lady potters. The trouble is that virtually nothing has been written about her. 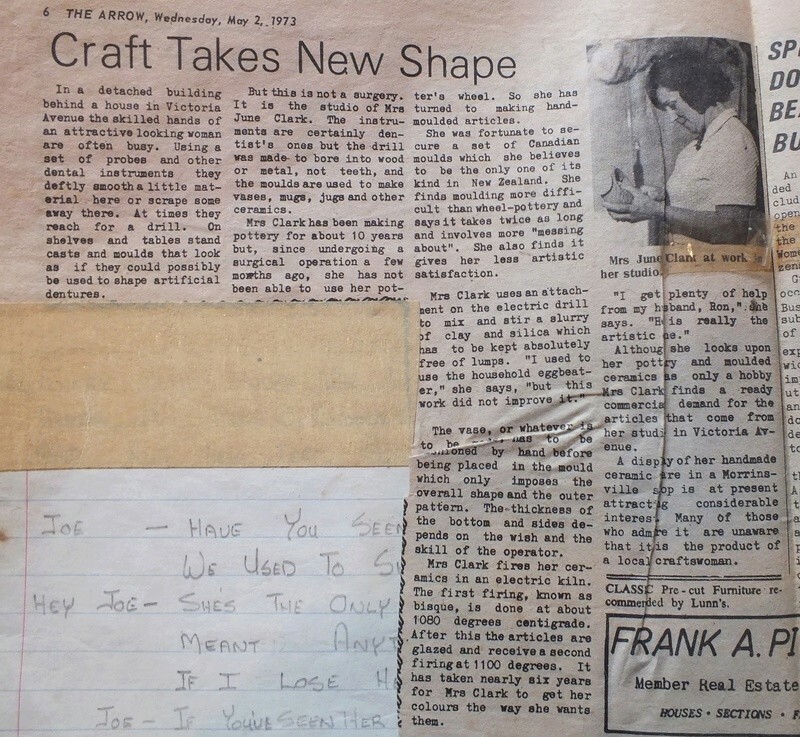 In a vacuum of information, it was tempting in the early days of collecting to consider her to be one of the many enthusiastic but ephemeral potters who were active for various periods between the 1950s and 1980s. But this is hard to do, because her work is durable, professional and highly distinctive in a number of respects. Preeminent among these are the vivid, thick, viscous colours June Clark preferred that make it impossible to pass a piece of her pottery by. Greens, blues, shot through with white like the spume on the crest of harbour swell. She even employed a red lead glaze, after some years spent searching for a red that worked. Another idiosyncrasy is that approximately fifty percent of Clark’s pieces found have been ramekin forms, a curious choice that has now nonetheless become emblematic of June Clark’s practice. There is a good story about how this came about too, though more on that later. 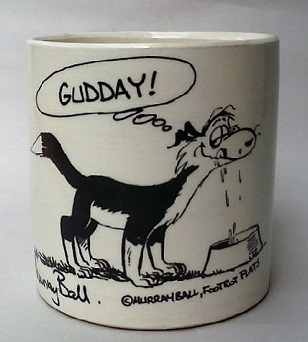 The pottery has a feel that allows anyone familiar with New Zealand studio ceramics to immediately associate it with the work of that first generation of female potters, and the fact that it is usually well marked as made in Morrinsville, further allows a NZ pottery anorak like me to assume Clark had some connection with that other fabled Morrinsville potter, Elizabeth Lissaman herself. But what was the nature of that connection? Who could one ask about it? It was all too easy to believe that June Clark had long ago departed to potters’ heaven. But guess what? 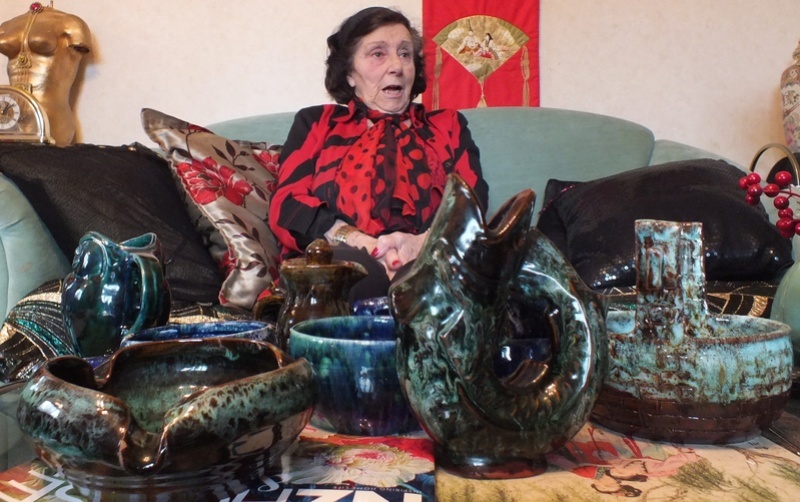 She hasn’t, and at nearly 89 years of age is all too happy to tell her fascinating story, one that makes her possibly the last living potter to have worked within the circle of that first fabled generation of lady potters, and to have sustained their arts and crafts “folk craft” ceramic style and tradition into relatively contemporary times. I visited June in her house in Morrinsville yesterday intending to stay an hour, but ended up staying nearly three. She does like to talk, which means we got a good picture of her life, personality and creative practice. Born in 1929, her mother [name] died [cause and place] when she and her twin sister were ten. Her father [name] , a master butcher was left with five young children; but rather than struggle dutifully on, in 1939 he abandoned them all in orphanages. June spent six miserable years – the entire period of the war with all its rationing and shortages – in the Meadowbank Presbyterian Orphanage in Remuera. She was released from that Victorian disciplinarian regime back to her father when she was 16 in 1945. June and her sister were put on a steam train by the Orphanage authorities. Her father was working in Tauranga at the time, but when the train was still some way north of that destination, it was brought to a shrieking emergency halt. Passengers stumbled, bags fell off overhead racks. Somebody had pulled the emergency cord. The two girls, along with the rest of the passengers craned their heads out the windows to see a frantic looking man running from an MG sports car. June’s father, drunk and driving erratically, had flagged down the train. He climbed into the carriage, asked where the girls’ bags were, bundled them out and into the car with nary a look at the startled railway guard. This was ominous and June believes the only reason her father had accepted them back was his calculation that they were now old enough to earn a living that could subsidize his loose living and alcoholism. Years later she read an obituary in the newspaper and had to consult her sister because the paper had the name spelled incorrectly. It was her father, who had died alone, a pauper in a home for alcoholics. She felt nothing. As June recounts these stories, it is possible to see her as she once must have appeared, and perhaps even thought of herself to some degree – a stray 4 foot 11 inch waif from the wrong side of the tracks; street smart by necessity but eternally mystified at the capacity of some people for callousness and self-centered cruelty. Redemption came in 1947, when age 18 and after not quite six months of courting, June escaped by marrying a dashing RNZAF airman 18 years her senior. It was one of the best decisions she ever made. Her husband Ron, was a stable engineer who actively encouraged and facilitated her later creative success. The couple had seven children and a loving and productive marriage of nearly 40 years. 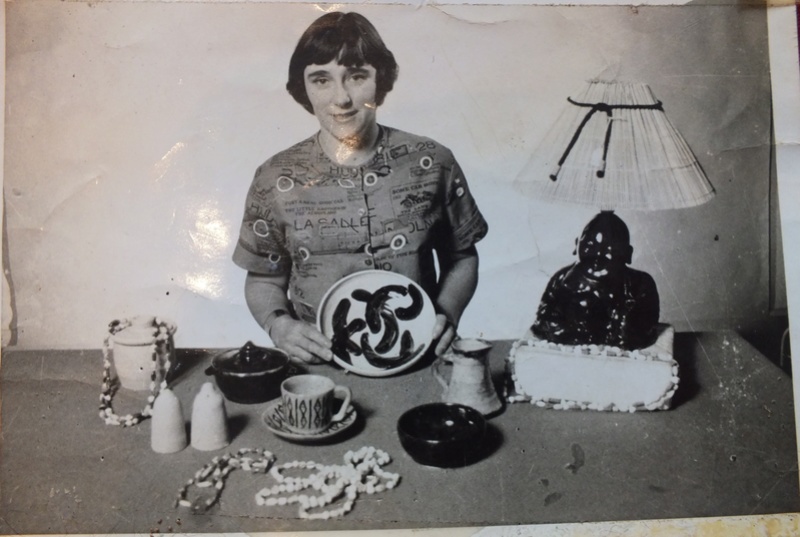 In about 1956 she was introduced to the second influential person in her life, the one who would shape the next three decades of her professional life – the great potter Elizabeth Lissaman. Lissaman was known as Betty Hall to her close friends, but is still called “Mrs Hall” by June. It is a measure of the reverence in which she holds Lissaman - “probably, no, definitely the best human being I ever met”. The fateful encounter took place at an IHC volunteering meeting. After venturing a cautious interest in the craft June was invited out to the Hall’s farm where Lissamen had built her own wood fired kiln. In the years that followed, it is fair to say that June undertook an informal and unpaid apprenticeship with Elizabeth Lissaman. For years she would travel out to the farm, sometimes several times a week, where she would do the work that the older Lissaman was finding more and more difficult, such as digging the local clay, mixing it with the clay Lissaman was importing from Cornwall to produce a more resilient body and kneading the mix until Lissaman found it right for her wheel. It may well have been June’s assistance (along with that of Lissaman’s husband [name]), which allowed Lissaman to maintain a higher output for longer than she would otherwise have been able. Lissaman was always anxious to involve June in the activities of the wider potting community. When a delegation of young potters made a pilgrimage visit to Lissaman, June was introduced to all of them, among other events. She was included in joint exhibitions of work. This makes it difficult to understand how pottery literature has so completely neglected June Clark’s contribution. The only reason I can think is that her proximity to the vaunted Lissaman cast her in a perpetual shadow from which she was never able to emerge. Her self-confidence was not what is would have been perhaps, had she enjoyed a more stable childhood, and in any case her profound respect and gratitude for Lissaman’s friendship and guidance meant it never occurred to her that history should have cast a little ray of light her way too. When I asked if Lissaman ever paid her for the work she did over many years (she had mentioned her shoulders still give her trouble as a result), June appeared surprised at the idea the question should ever have come up. June casually mentioned that one year at the start of the 1960s Elizabeth Lissaman asked her to accompany her on a road trip to visit Barry Brickell in his early years at Driving Creek. I must admit that when this morsel started rattling around my tiny pottery collector’s brain, it had approximately the same effect as if June had just revealed that Galadriel had whisked her off on a road trip to visit Frodo Baggins. This trip had a slightly unexpected influence on June. While she was astonished by Brickell’s virtuosity as a potter of large objects, she realised her small stature would never allow her to tackle such sizable works. However, the unexpected detail that lodged in her mind was of a set of ramekins that Brickell had produced as part of his 1960s domestic ware range. She picked them up and turned them over. The handles looked thin and brittle. She was distinctly underwhelmed. This is something I can do better, she thought. The modest ramekin became her signature form. She produced approximately two dozen per week for at least 20 years, so it is no surprise that they turn up in Op Shops. She sometimes sold them as sets of six with a large bowl, which she dubbed “the curry set”. These should be considered as emblematic of June Clark’s pottery as the delicate Peanut Bowl sets are within Elizabeth Lissaman’s oeuvre. June remembers the 1960s as her and Ron’s most productive decade. Reed and Barton, a Hamilton department store had window displays of her pottery, and she would regularly send consignments up to craft shops in Auckland. Interestingly the couple made ceramic jewellery in quite large volumes for four airports around the country, including Whenuapai, which was Auckland’s international airport until 1965. This jewellery was mainly bisque unglazed ceramic bead necklaces which were sent in batches of 140 to the airport gift shops. Only a very small proportion of these beads were glazed because they were too fiddly, so most of the beads were made in different shades of unglazed pottery. 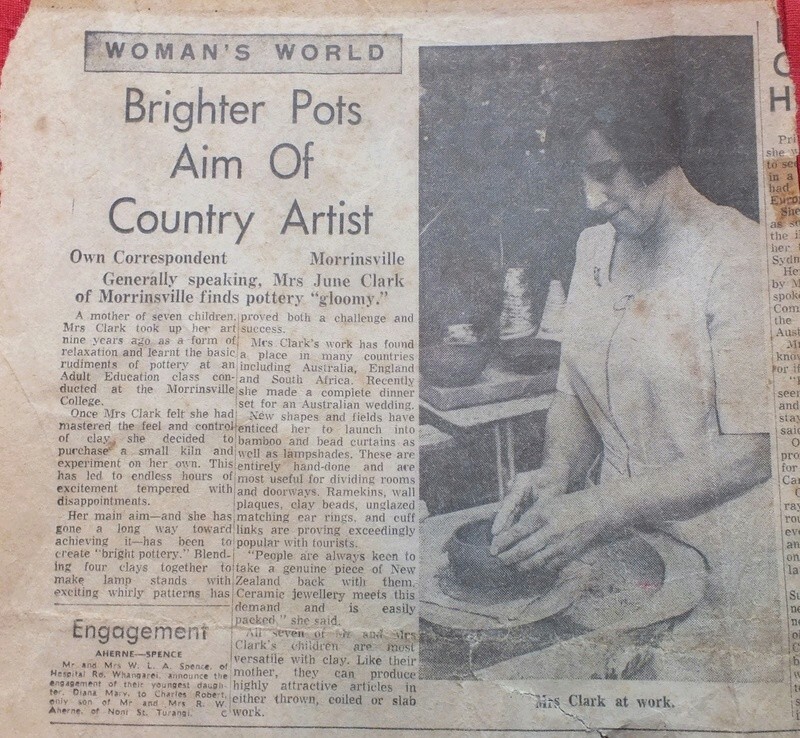 She also made solid, richly glazed ashtrays for the local pub-hotels in Morrinsville, but the management found they were too attractive to the punters and so many were going missing that it became uneconomic to keep on replacing them. Ron Clark was far more than just a helpful husband. He took full part in the development of June as a potter, from the first kick wheel he manufactured for her (he owned Clark Engineering of Morrinsville) to installing the four electric kilns June ran at her peak, to forming and applying handles to mugs and ramekins. 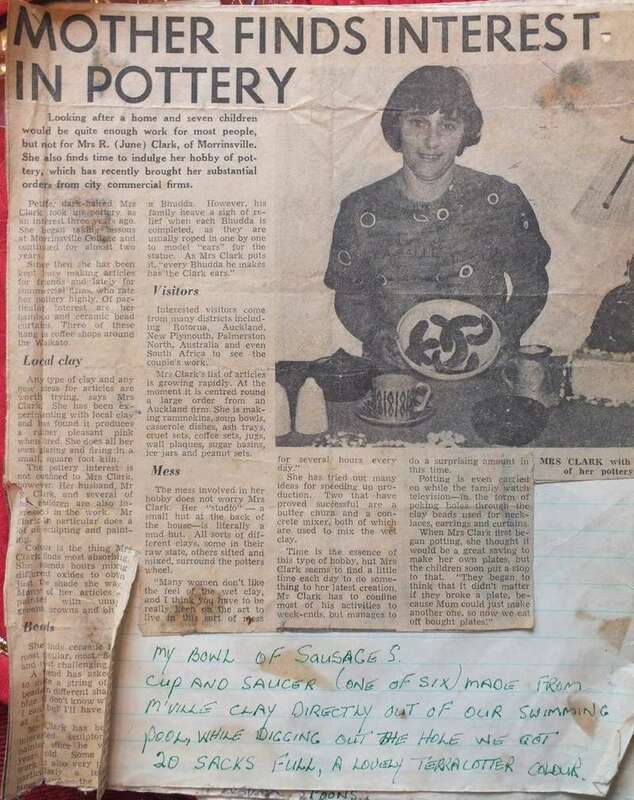 It was Ron who encouraged her to begin comprehensively marking her pottery “June Clark, JC, Made in Morrinsville, NZ). Previously June had simply marked her pots JC, NZ; so pots found with this briefer marking are likely to be from the late 1950s-early 1960s. Ron was also a ceramic sculptor of some ability. 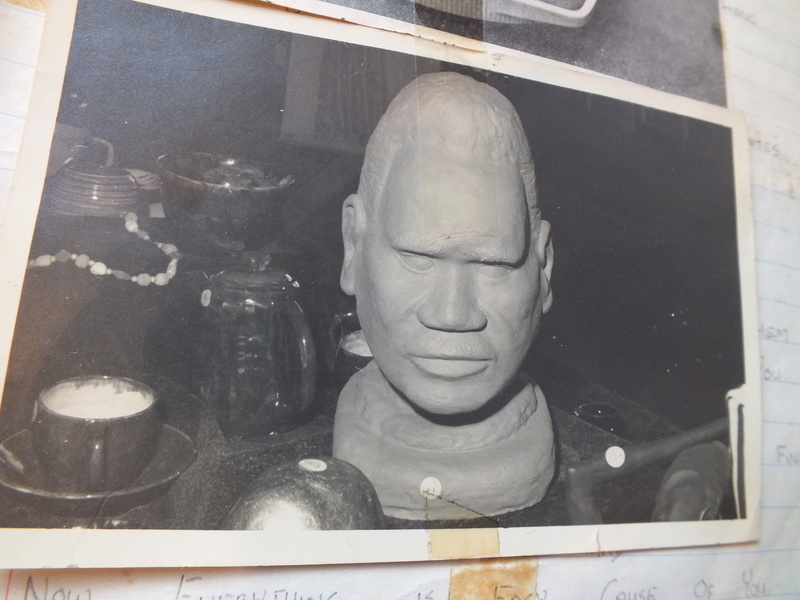 Through the 1960s he modeled articles such as Maori busts, Buddha figures and curious 1960s biomorphic towers, 10 of which he sold to opticians (8 in the South Island) for the counter display of spectacles. June made a firm decision to eschew the browns, greys and other muted natural tones that dominated New Zealand ceramics from the 1960s to 70s. In addition to mixing her own glazes, she imported a number from America on her own account, which is why her pots look so distinctive within the wider body of New Zealand ceramics. In doing so she helped sustain the pre-war arts and crafts tradition of colourfully glazed small articles, pioneered by Olive Jones and Briar Gardiner, through the Anglo-oriental period. She was one of only a very small group doing so, including Mavis Jack and Phyllis Atkins. Pelican jug of distinctly Arts and Crafts cast. Marked only 'JC NZ' from the early days (c. late 1950s-early 60s) and probably one of half a dozen. Her electric kilns were configured for a maximum temperature of 1200 degrees centigrade, but her usual practice was a bisque firing at 1080 degrees followed by a glaze firing at 1100 degrees. Following an injury that necessitated an operation in the early 1970s, June found throwing at the wheel difficult for several years. At this point she learned the techniques of slip casting, low temperature gilding and even transfer application onto ceramics, so cast ware from her kilns with these decos can also be found. The time she had been potting for is wrong in this article. It should read 'about 15 years'. The end came in 1987 with the death of her husband and soulmate Ron. June couldn’t face walking into her workshop without him, and after grinding out the last outstanding orders, she closed the operation for good. 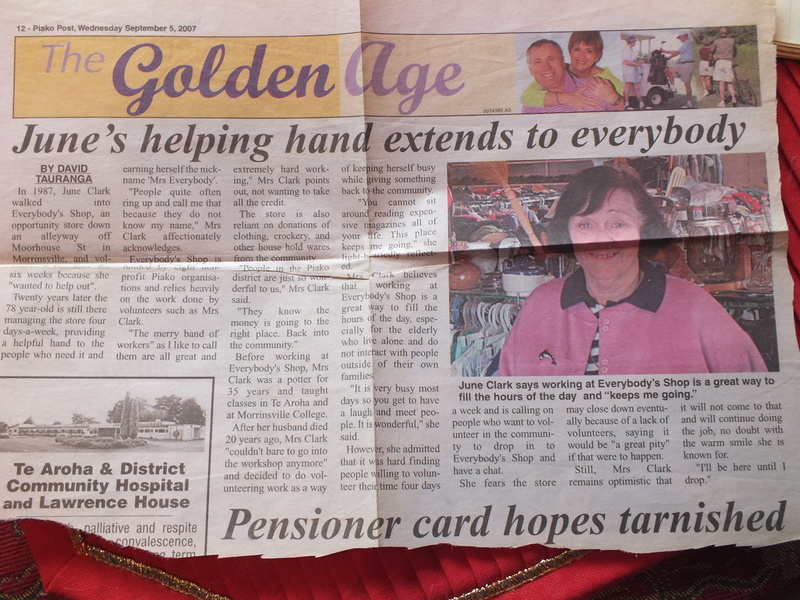 It led her to a second career as the manager of Morrinsville’s then only Op Shop, “Everybody’s Op Shop”, which she managed for 26 years. Everybody’s is the IHC’s charity shop – the organisation through which she met Elizabeth Lissaman over 60 years ago. 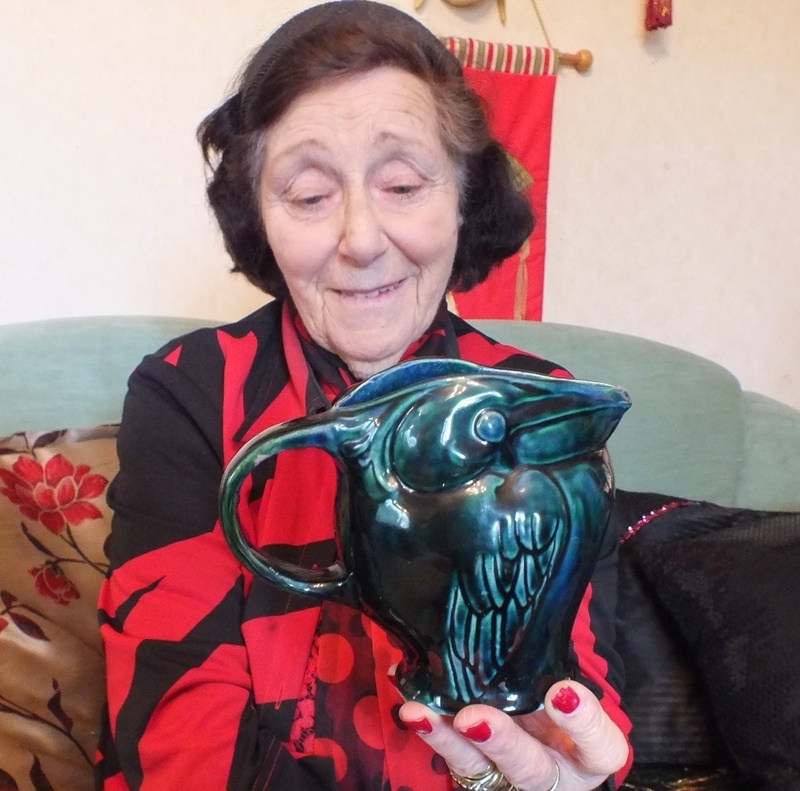 As June says, “Without Mrs Hall, I would not have been a potter”. June Clark seems to be a model expression of the Arts And Crafts principle that craft should be socially redemptive. One wonders whether Lissaman had this consciously in mind as she set about methodically training June, involving her in the activities of the wider community, nurturing her unfocused creative drive and ultimately helping to bring about the actualization of the creative potential of a woman who had experienced an adverse start in life. I like to think she did. This is wonderful information. Thank you, Tea n coffee. Wow this is such an in depth article on June Clark. Thank you for the insights and what an awesome clay journey she had. I find her glazes striking for the times and I don't think there is anything from that time to compare them to. I was aware of June, but now I want to hold a piece of her work in my hands to sense her outstanding pottery abilities.